Good morning! I’m so excited for the March Year Round Christmas project! This month, I am doing a quick Christmas present: pillowcases! These pillowcases are a quick, frugal present to make! Even though it is a quick project, I’m not posting it quickly because grandbaby visited yesterday. It wouldn’t be a Christmas surprise if we made it together. 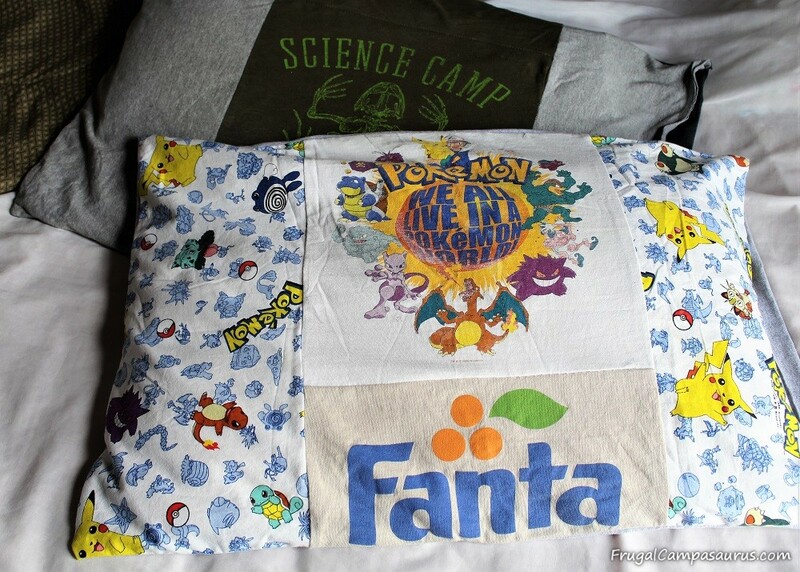 The pillowcases re-use old t-shirts, so it is a great way to save money and make a personalized present. Presents that are related to someone’s interests are great-like dress up clothes for the young, aspiring rock star or pirate! It is even better when they are frugal. I save many of the kids’ old t-shirts. I say I like doing projects with them. Making quilts, pillows, pillowcases and bags is fun, but mainly I save them because it is hard to get rid of them. I love the old shirts that remind me of their favorite cartoons and how young they once were. 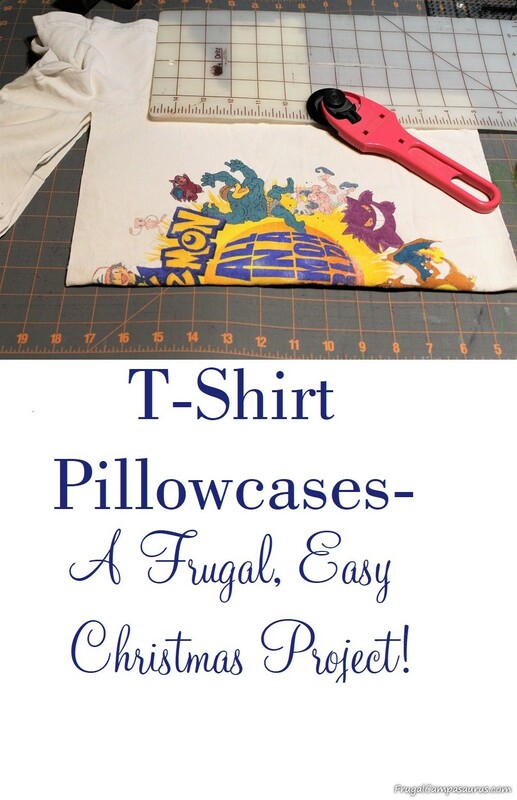 Even though I’m making the t-shirt pillowcases early (and not the week of Christmas), it is such a quick project that it would be a great last minute Christmas present! A few pillowcases could easily be completed in an afternoon. Looking through all the shirts and picking the right ones took me more time than the sewing did. 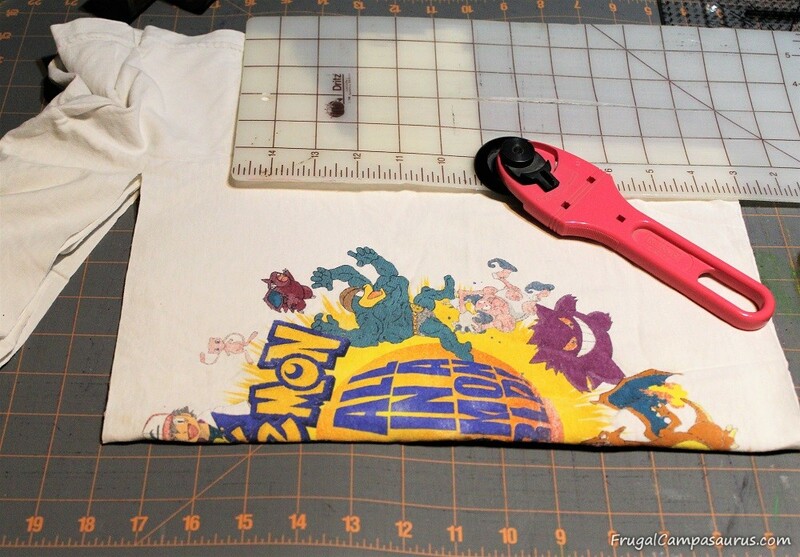 After picking out a few t-shirts, it is easy to sew a few seams for the pillowcase. My pillowcases are roughly 20 inches high by 30 inches long, but make sure to measure one of your other pillowcases to get the right fit for your pillows. I use a half inch seam and made the pillowcases 20 by 30 inches. When sewing the t-shirt material, I use a slight zigzag stitch. I make the width of the zigzag smaller and the length longer. This makes a slightly wobbly straight stitch that will still stretch with the material. 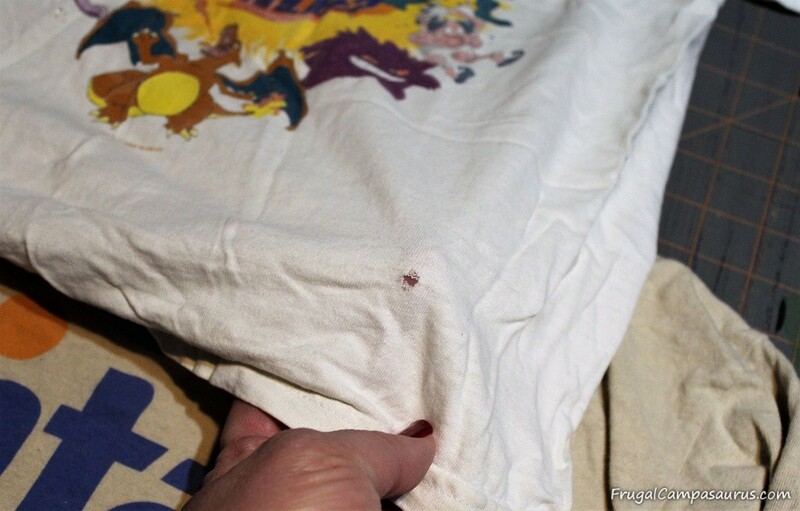 A straight stitch might not stretch and give when the t-shirt material stretches, then it could break the thread. 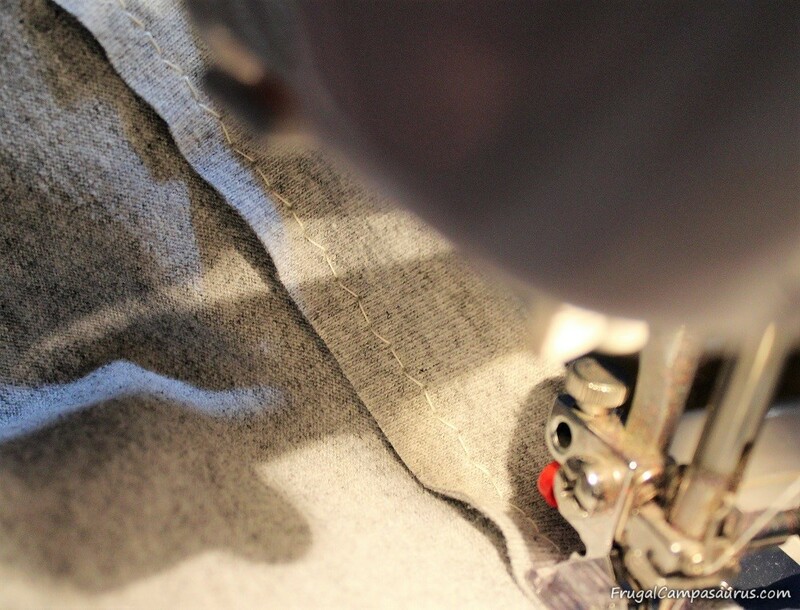 When sewing the t-shirt material to the cotton fabric, I used a straight stitch. I don’t want a lot of seams, because I’m not sure about sleeping on them- it might be uncomfortable. To have just a few seams, I like 3 sections of material on the front of the pillowcases. Usually, I pick a printed t-shirt for the middle with a section of solid t-shirt fabric on each side. For the white t-shirt, I needed to have 2 pieces in the middle because of a hole. So, I chose 2 t-shirts the grandbaby would like. Orange trim would have looked nice in between the shirts, but I didn’t want to add more seams. I like the soft (free) t-shirt material for the whole pillowcase. But for the white pillowcase, I already had matching cotton fabric, so I used it. To make it easy, I didn’t measure the first t-shirt. I didn’t even cut off the sleeves and neckline like I usually do for quilts. I just cut around the design I wanted, and then tossed the scraps ( though don’t tell the husband- he would be shocked because I save all scraps). I left 1-2 inches around the design for seams. At the last minute, I did remember to measure the second design for the pillowcase. The 2 designs for the middle of the pillowcase needed to be the same width, but since it is a smaller design, I almost forgot to make it big enough. I am also glad that I double checked how the designs were facing. I put the ‘right sides’ together before sewing the seam, these will be the sides that will show when it’s finished. 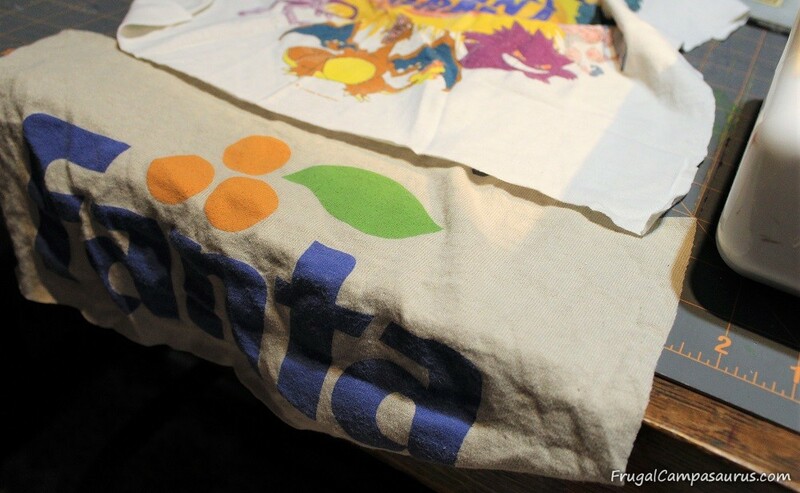 The Fanta t-shirt was folded up over the other shirt and a half inch seam joined them. Then, I measured the middle piece of t-shirt fabric, it was roughly 14 inches. I cut 2 9 inch by 20 inch rectangles of the other,cotton fabric. These were sewn on the ends of the design t-shirt. 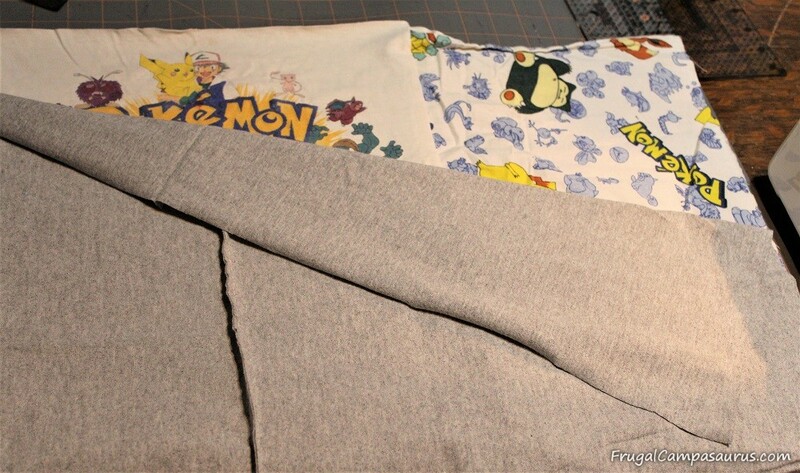 Once the front was finished, I cut 2 pieces for the pillowcase back out of t-shirts. Since 1 t-shirt wasn’t big enough, I used 2 rectangles that were 20 by 16 and sewed them together. Placing the right (the sides that will show when finished) sides together, I sewed around three sides of the pillowcase. I sewed the final hem before flipping it inside out. Flipping it inside out, makes the correct side on the outside. The final, 1 inch hem was easy to sew without pins. I just turned it under, and held it, as I sewed. This is a circular seam, where the pillow goes in when it is all finished. 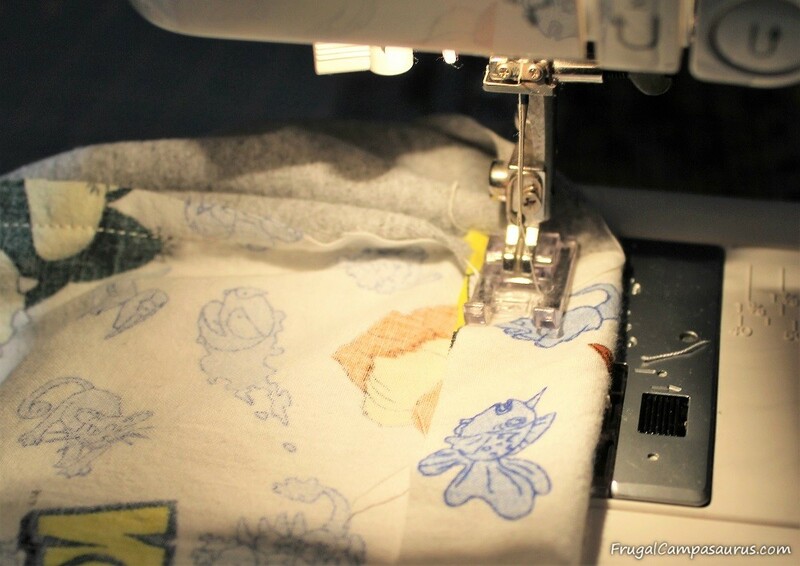 It is easier to sew this seam last, with the front and back of the pillowcase already joined. A continuous, circular seam is much easier to sew than trying to measure and match up an already hemmed front and back side. The t-shirt pillowcases were such an easy, Christmas project! I’m glad I made them for the Year Round Christmas Challenge 2. It is great to have a present already done for Christmas! This set of pillowcases is for the grandbaby, but they were so quick to make that the older kids might get some as Christmas presents also. They would even be fun stocking stuffers for the older kids- guess I will need to sort through t-shirts again!